The group of 23 wild Konik horses which arrived in the Ukrainian village of Orlovka on March 26 represents the first translocation of such animals into the Danube Delta. 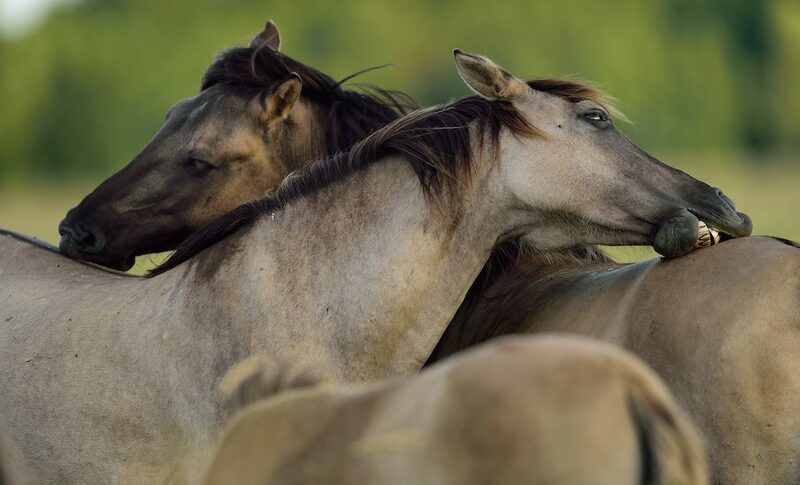 Two herds of wild Konik horses will soon be roaming the landscapes of the Ukrainian Danube Delta, boosting the area’s biodiversity through their natural grazing. A shipment of 23 horses (made up of two family groups) arrived in the small delta village of Orlovka on March 26, having made the long road journey from Latvia. Despite the lengthy trip of around 1800 kilometres, which took nearly two days and two nights, all of the animals were pronounced fit and well on arrival by a veterinarian. Following a quarantine period of 30 days in Orlovka, the two Konik families will be relocated to different parts of the delta. One family will stay in the upper delta, close to Orlovka, where the mature floodplain ecosystem comprises mainly hardwood forest along lake shores (the Danube Delta is home to some of Europe’s few remaining grazed mosaic forest landscapes). The second family will be moved to the delta floodplain, which mainly comprises islands, riverine forests, grasslands and marshes. The sturdy Koniks, which lived over 20 years in the wild in Latvia, are well-suited to a life in the delta, and are used to defending themselves against predators. As a breed, Koniks are related to a now extinct wild Eurasian horse known as the Tarpan. Like their ancestor, they are resistant to harsh climates and severe weather conditions. Adapted to foraging in the wild, they can live on a limited amount of food and have an extremely resilient immune system. The sturdy Koniks, which lived over 20 years in the wild in Latvia, are well-suited to life in the Danube Delta. 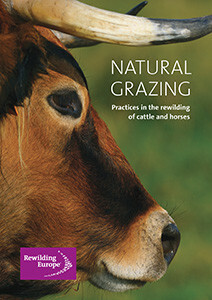 The publication on natural grazing compiled by Rewilding Europe in 2015. A large part of Europe’s biodiversity is based around open grassland, mosaic landscapes and their transition to forest edges, open woodland and groves, which all rely on herbivorous grazing for their existence. Yet rising levels of land abandonment, leading to a reduction in livestock numbers, mean that such grazing is now increasingly absent. As large areas become overgrown with shrubs and forests as a result, so their biodiversity is declining. Rewilding Europe, which published a booklet on natural grazing in 2015, wants to reverse this decline by returning Europe’s native herbivores – such as wild horses, as well as bovines, chamois, deer and ibex – in significant and naturally balanced numbers to the lands where they once belonged. In addition to the Danube Delta, we are currently reintroducing wild horses in three other operational areas: the Rhodope Mountains of Bulgaria, the Velebit Mountains of Croatia, and Western Iberia. Read more about Rewilding Europe’s efforts in the Danube Delta here. Visit the Rewilding Danube Delta Facebook page here.